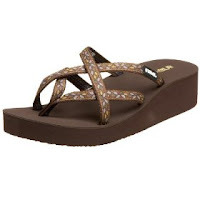 My friend Nicole visited with me a few weeks ago and I so loved her Teva sandals that I mentioned them on my blog. Well…she just sent me a more “hip” pair of Teva sandals (her words, not mine) as a thank you for letting her stay with me. It was totally not necessary, but much appreciated! They are really cute and sooooooooo comfy!